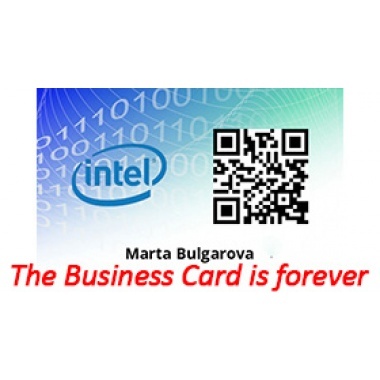 UBC, (Universal Business Card) the business card revolution in pdf format only front. You can link to your UBC unlimited embed contents. You can upload your own files. Note: anyone will shoot your UBC will be in direct contact with you and will enter in your personal QR-room, he can even add comments and notes to your UBC. You'll have a quick email notification each time your UBC will be read. To view more UBC demos and have more details on QRPlaza UBC, please click on the link below. QRPlaza.com - the social of things - the first International communication and certification platform on net based QR-code, it is the most simple and immediate way to certify the authenticity of a product, to meet new friends in public places in discos, in pubs, at the beach, on public transport, on cruise and interact with them for a night, a day, the time for a vacation, a lifetime. QRPlaza.com - the social of things - using a proprietary technology, enables the verification of the originality of the products in real time. In addition, the purchaser of the product, after buying, may decide to enter the brand room of the manufacturer and interact with all the other people who have purchased a product of the same brand.
" I just bought QRPlaza UBC for my company! It's really a great solution and I can save a lot of money for my employees. Don't need to reprint the Business Card anytime one of my employees change some personal information. Really great." " Without a doubt one of the best solution on the market. Now I can share my playlist and preferred video on my QRPlaza T-shirt and get people comments...I met a lot of friend in this way." " I purchased some QRPlaza Cards and I used them for my gifts and to share my contents on Social Network. A great innovative solution that I really appreciate." " Wow! I used QRPlaza Secure labels on my bottles of craft beer and I unleashed a real social phenomenon among my customers. In addition, on each label I communicate the novelties of my products and through the my brand room we are in touch with our consumers...It's a revolution in marketing!" "I think that QRPlaza Keysback it's a wonderful solution to give innovative gifts to my clients. I bought 2,000 Keysback for my dealership's customers. The best way to allow them to recover their lost keys."